This Article first appeared on the old GravelStudios.com in 2008, and is reproduced here for your instruction and enjoyment. Every so often, when I’m at the grocery store, I stop by the magazine rack and thumb through the latest issue of Nintendo Power. And I’m always just a tad disappointed. Don’t get me wrong—It’s still a good magazine. I’m sure they’re doing a fine job of competing for subscriptions with all of the other polished, mature looking video game magazines out there. I just wish it looked a little bit more like the Nintendo Power of my youth. The Nintendo Power that was more kid-oriented…that was more colorful and fun. Recently, Nintendo Power celebrated its 20th birthday. 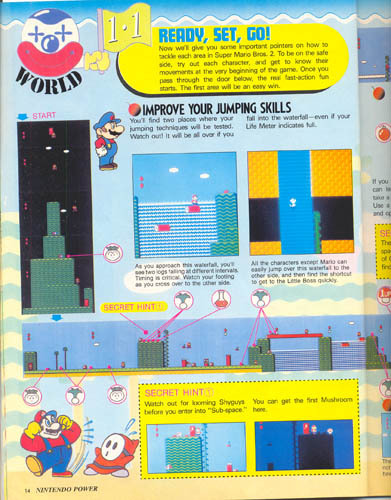 In honor of that celebration, I’d like to reminisce a little about my experiences with Nintendo Power, and take a look at some of the highlights from the first issue of Nintendo Power. These are the things that I found interesting as a kid, and that I still find interesting today. My family didn’t get a subscription to Nintendo Power when it first came out. We didn’t get on the bandwagon until volume 20, January of 1991. That was when Nintendo was giving away free copies of Dragon Warrior with new subscriptions to NP. My mom (always with an eye for a deal) figured that the game was worth the price of the magazine. My brothers and I were addicted from the moment we first saw it. We used to fight over who got to read it first. Not too bad for a 100 page Nintendo commercial that you PAID them to mail to you. Eventually, my brother Joe decided to order the first year set of NP, which he kept hidden in a locked cabinet, along with his dirty magazines, Lord of the Rings boxed set, and everything else he didn’t want his younger brothers messing with. Those NP magazines were like the grail to me, as is the case with anything an older brother won’t share with a younger brother. Never the one to be outdone by Joe, I decided that I would gradually collect EVERY issue of NP. There’s no time like the present, right? So I used my allowance to get my own subscription. So for one year, our house received 2, yes TWO identical issues of Nintendo Power every month. It was my intention to save my allowance and order all of the back issues up to that point (including the ones my family already had—I wanted my own full set, and those were the family’s, not mine). Well, you know how kids are with money. And by the end of my subscription’s first year, I realized there were a lot of things I wanted to spend my allowance on a lot more than every issue of Nintendo Power. Fast-forward about 15 years. My brother Sam and I are cleaning out the storage room and come across a box containing every issue of Nintendo Power that my family ever received—including that first year set that Joe had so carefully hidden. He’d gotten married and moved out years before, and I’d started a collection of NES and SNES games and accessories. I’m not completely sure why he left them behind, but it doesn’t matter. They’re mine now. Hahahahahahaha!!! 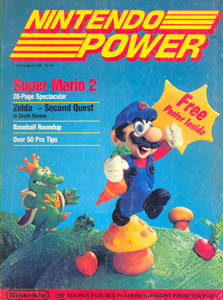 The magazine begins with extensive coverage of Super Mario Bros. 2. This really sets the tone for the rest of the magazine. The layout, artwork, maps, and wording of the hints are classic NP. Pretty much every article on every side-scroller for years looked exactly like this. There is similar coverage for the second quest of Zelda, which I am embarrassed to admit I still haven’t completed. 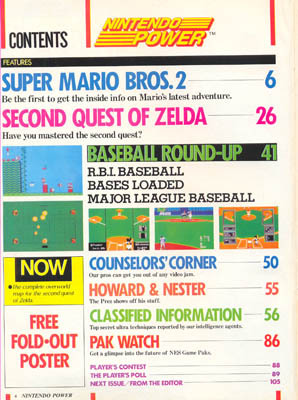 At the end of the Zelda article is the famous NP poster, which has a map for Zelda’s 2nd quest on one side, and a rather generic poster on the other side for Bases Loaded/R.B.I. Baseball/Major League Baseball, followed immediately by an article about those three games. I never liked sports games much, so, yeah, whatever. Next, is one of my favorite parts of NP, Counselors’ Corner, in which Game Counselors answer reader-submitted questions about games. This one’s a doozie. 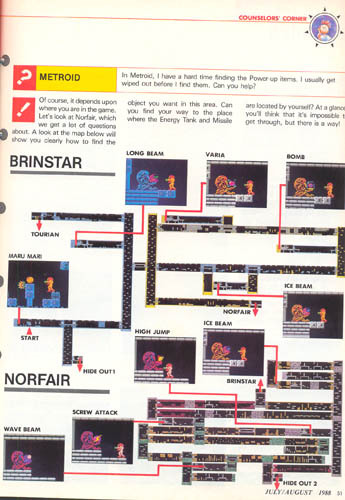 Included are full maps of Brinstar and Norfair from Metroid, the unlimited 1-ups trick from Super Mario Bros., and how to beat Mike Tyson (yes, the MIKE TYSON) in Mike Tyson’s Punch-Out. Talk about some hints! Next is the cartoon Howard & Nester which, I have to admit, I wasn’t much of a fan of. I usually just skipped it. Nester was a jerk, but I did miss Howard Phillips when he left Nintendo several years later. The magazine gave him a very teary farewell. Classified Information comes next, and the idea is very similar to Counselors’ Corner, except instead of reader submitted questions, it’s reader submitted hints. Other than the Konami Code, this edition’s pretty ho-hum. 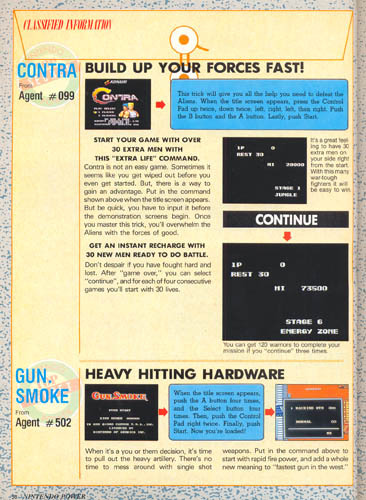 Then we have pretty standard coverage of Double Dragon, Gauntlet, Contra, and some other games, as well as Pak Watch, a monthly feature giving short descriptions of upcoming games. And then there’s the Player’s Poll, a sort of contest where you can win prizes by mailing in a survey card. The only reason this one is still in the magazine is because it was a back issue. Joe sent in the Player’s Poll as soon as he read the magazine every month (and if he didn’t, another one of us did). Early on, NP tried really hard to look like a real magazine and not just an advertisement by printing quasi-news articles. 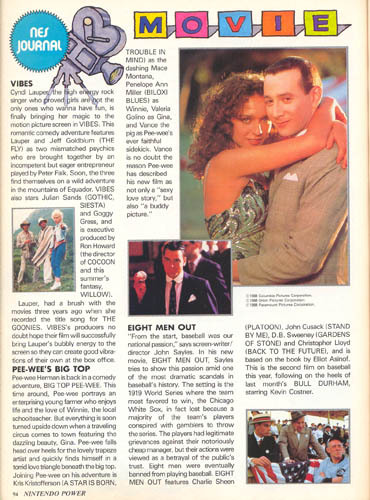 Here we have a review of Pee-Wee’s Big Top with a rather creepy picture. 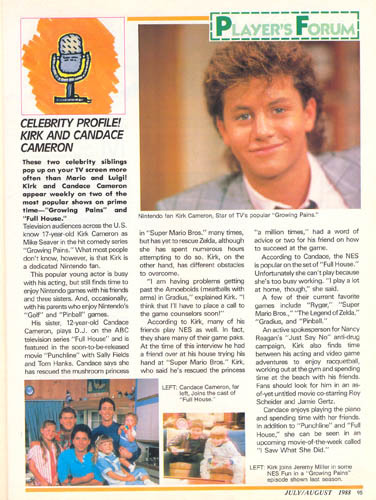 There’s also an article about wonder siblings Kirk and Candace Cameron (of Growing Pains and Full House respectively), in which they extol the virtues of NES games. At the end of the magazine is Player’s Forum, where we can read letters from readers, which are always unintentionally hilarious. I will admit, I sent in my fair share of letters to NP, and I learned something in the process. If you were willing to wait for the response, you could get any info on any game by asking in a letter, and it only cost you a stamp (as opposed to the $79.99 a minute that it cost to call the Game Counselors on the phone). I beat a lot of games by writing letters to NP. In the Player’s forum, we also have the top 30 (The Legend of Zelda, Mike Tyson’s Punch-Out, and Metroid are in the top 3 spots). 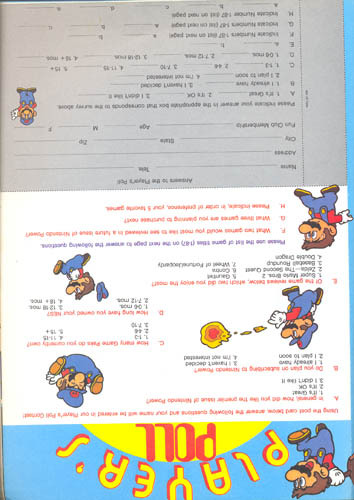 The very last thing in the magazine (other than the subscription card) is a letter from Howard Phillips himself, in which he describes the process of creating the first issue of Nintendo Power. It’s a fitting end for the beginning of something wonderful.